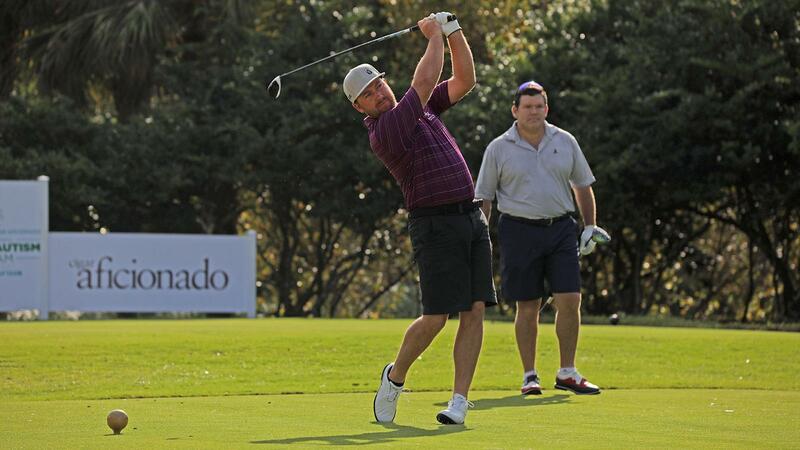 Pro golfer Graeme McDowell teeing off on the first hole at Old Palm as Brett Baier from Fox News watches. Graeme McDowell, winner of the 2010 U.S. Open, smiled as he selected a La Flor Dominicana Coronado Toro from the table near the first tee box at Old Palm Golf Club in Palm Beach Gardens, Florida. He then took out his driver, smashed a shot like a howitzer down the fairway, then lit up. You can’t blame him for smoking a cigar—after all, McDowell was paired with a foursome of ardent cigar enthusiasts. In his group were Cigar Aficionado editor and publisher Marvin R. Shanken, radio star Rush Limbaugh, Fox News anchor Brett Baier and former New York City Mayor Rudolph W. Giuliani. 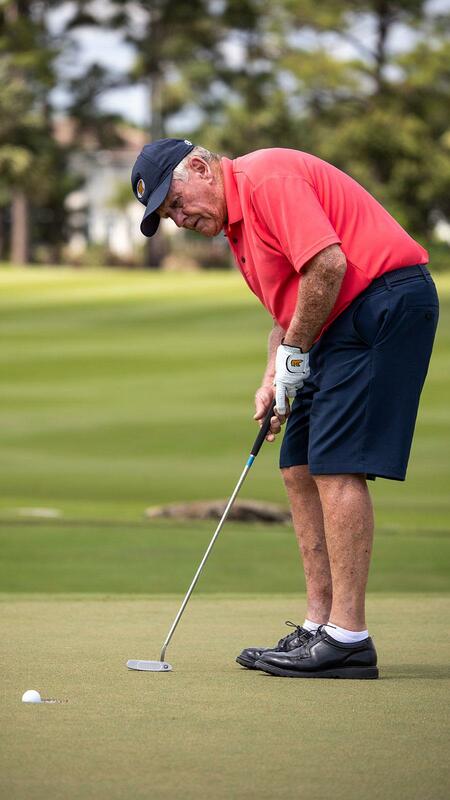 Golfing legend Jack Nicklaus, who has won 18 majors, sinking a putt at the Els for Autism Pro-Am. Scenes like this were happening all over the golf course on Monday at the 11th annual Els for Autism Pro-Am, which raised $1,020,000. Over the 11-year-history of the event, created by Shanken and pro golfer Ernie Els, approximately $11 million has been raised. Twenty-one teams played yesterday, each of them paired with a prominent golfer. In addition to Els (a four-time major winner) and McDowell, there was Jack Nicklaus, who has won 18 majors, more than any other player; Branden Grace; Cameron Tringale; CT Pan; Cristie Kerr; K.J. Choi; Marc Leishman; Luke Donald; Louis Oosthuizen; Chase Koepka; Anirban Lahiri; Charl Schwartzel; Li Haotong; Morgan Hoffmann; Jessica Korda; Kiradech Aphibarnrat; Ian Baker-Finch; Nick Price and Abraham Ancer. 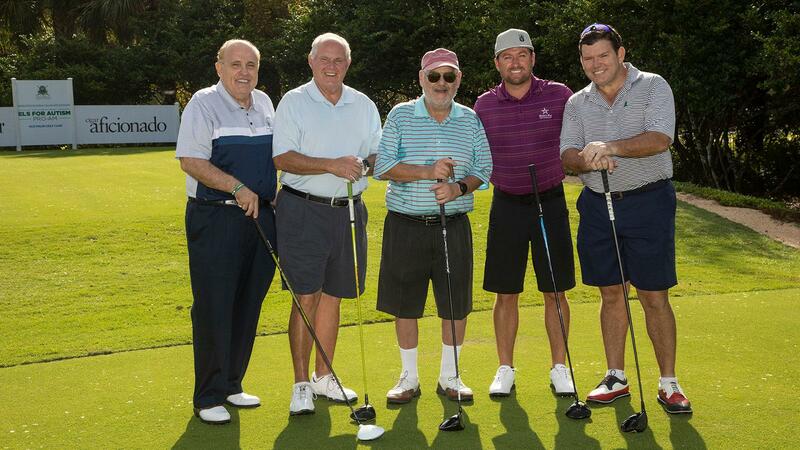 Marvin R. Shanken (center) led the team of Rudolph W. Giuliani, former Mayor of New York; radio star Rush Limbaugh; pro golfer Graeme McDowell, winner of the 2010 U.S. Open; and Fox News anchor Bret Baier. The money raised has gone to the development of the Els Center of Excellence, an education center in Jupiter, Florida. “We feel it’s an absolute game changer in the world of autism,” Els said at the pairings dinner on Sunday night. The winning team, featuring LPGA star Jessica Korda, shot 55. Her playing partners are Steve Collis, Steve Peck and Jerry DeMuro. Teams were fielded by Bacardi, Breakthru Beverage Group, Brown-Forman, Diageo, Deutsch Family Wine & Spirits, Fetzer Vineyards, Jackson Family Wines, M. Shanken Communications Inc., Michael Gelband, Moët Hennessy USA, Norman Eig, Pernod Ricard, Republic National, SAP, Sebonack Golf Club, Southern Glazer’s, Stonehage, Terlato Wines and Young’s Market Co.
Ernie Els, showing the smooth swing that gave him the knickname "The Big Easy," taking a shot at a $1 million hole-in-one. The event was won by the team of LPGA pro Jessica Korda, Steve Peck of SAP, Jerry DeMuro, and Steve Collis. 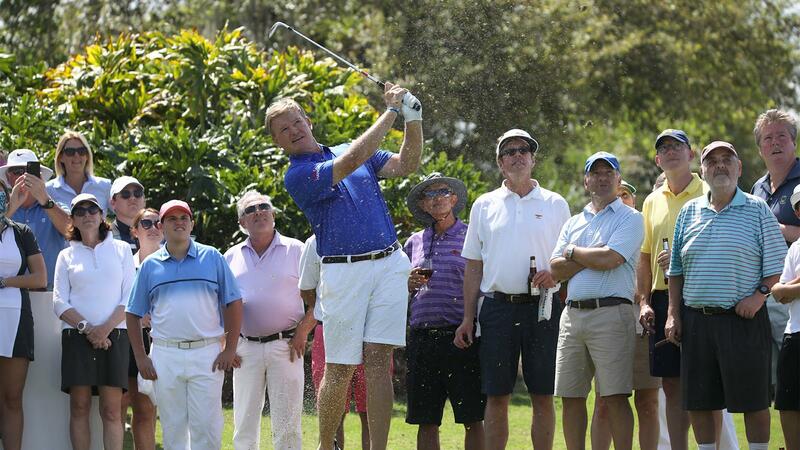 Cigar and drinks stations were spread throughout the course for the Pro-Am, keeping a festive mood throughout the day. Drinks were provided by Belvedere Vodka, Glenlivet and Grey Goose, and cigars were provided by Alec Bradley, EPC Cigars, La Flor Dominicana, My Father Cigars and Oliva. Bobby Jones donated shirts. Arturo Fuente and Altadis U.S.A. donated cigars for the dinner on Sunday evening. The event concluded with a hole-in-one contest, where each pro takes a shot at Old Palm’s 19th hole, a tricky green defended by water. The event was sponsored by Wine Australia, and a successful shot would have given $1 million to the charity. No one aced the hole this time, although Schwartzel came closest, with a shot that settled 5 feet from the cup.